Menu of distractions has gained another item with a new fad called ‘Pokémon-Go’. I will not venture into describing what this new video app for smart phones is except calling it a ‘killer app’ that is capable of actually killing. Just this week an Australian newspaper, AGE of Melbourne reported of a 19-year-old driver overshot a roundabout, lost control and smashed through a fence before hitting an empty classroom at a secondary college, all while trying to catch a Pokémon. Fortunately, no one was injured. It is utter coincidence that only a few days prior to the crash the local police in Melbourne had forewarned motorists of such behavior by placing 40 electronic signs around Melbourne with message ‘Don’t Pokémon and Drive’. Apparently this is not the world’s first Pokemon-go crash. A Baltimore man was caught recently on camera crashing into a police car because his focus was on catching ’em all. Here also the driver escaped injury but confessed he was playing Pokemon-Go behind the wheel. Now, go across the Pacific to Japan where Pokémon-Go characters were reportedly found within the Fukushima nuclear exclusion zone. No mishaps have occurred but authorities are not taking any chances and have requested that the area be classified as ‘No Pokémon-Go zone’. The company has also banned employees from playing Pokémon-Go on site. However, things got little bit scary recently when three Pokémon-obsessed teenagers managed to make their way onto a nuclear power site in Ohio. It is surprising to see so many among us shy away from the primary task at hand and getting engrossed in tasks that can be easily postponed. Getting distracted while driving or walking is becoming a norm among all age groups. Looks like we have started to practice the driving behaviors of the future when the self-driving cars will become the standard mode of transportation. We are not there yet, and let us not rush it either. 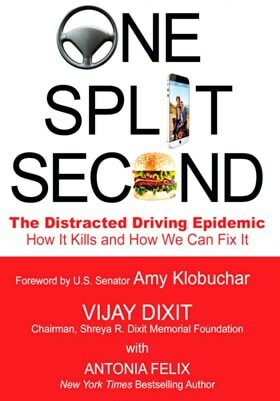 I lost my daughter Shreya to a distracted driver. Many among us are living with the ‘it cannot not happen to me’ syndrome. Believe me, it can happen to anyone. I am not any different than a regular American. Distracted driving is like playing with fire. It does not spare anyone from its fury. Do not ignite PokemonGo while driving.